Isabella is now almost 10 months and is really beginning to interact with toys that she used to just ignore (or attempt to eat!) It's incredible how much she has already learnt and how quickly she is learning new skills. We can now play with her toys during the day, one of our favourite games has been rolling different balls backwards and forwards. At the start of the month Isabella would just pick up the ball and chew on it, but now she picks the ball up and 'throws' it towards me. I can't wait to see what she'll learn throughout February! 1) Oxo Tot Training Cup in Raspberry* - Isabella is constantly wanting to be more and more independent, especially with her eating. At the end of the month she has much preferred finger food rather than spoon fed meals and drinking water all by herself. 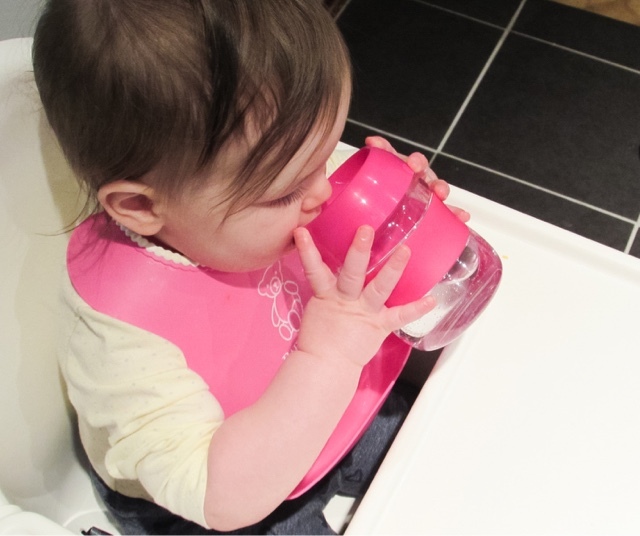 To do this we've been using the Oxo Tot Training Cup and it's just what she's needed. There is a translucent lid insert, which has small gaps for the water to flow out as if it was a 'normal' glass. The advantage of this is that when she inevitably knocks it over all of the water doesn't pour out all at the same time. The lid insert slightly delays the water pouring out, therefore reducing the mess. I honestly can't recommend it highly enough! You can read all about our experience with the Oxo Tot weaning tableware here. 2) VTech Grow and Go Ride On - Isabella's grandparents gave this to her for Christmas and she's spent a lot of time 'driving' herself around our living room. 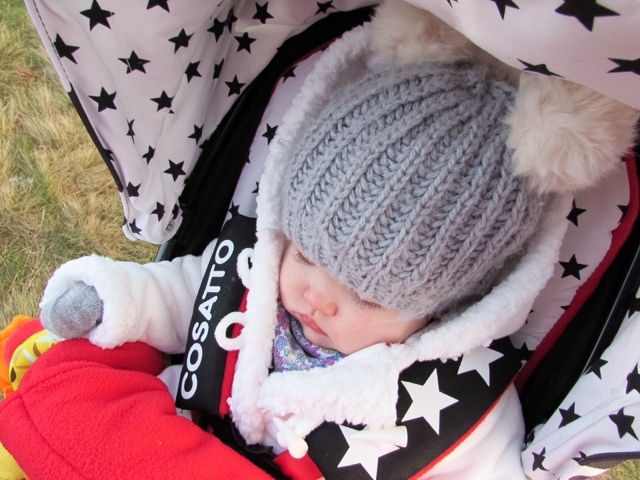 We currently have it set up as a rocker and a few days ago she learnt to rock it herself! There's a light up panel on the driving wheel attachment, which flashes while it's singing. Very interactive, multi sensory and entertaining - ideal for Isabella's age of nearly 10 months. 3) Wooden Taxi from Wilkinsons - We gave Isabella this in her stocking and she has loved pushing it along our coffee table. She also enjoys it if I push it to her and she pushes it back, such a sense of pride. 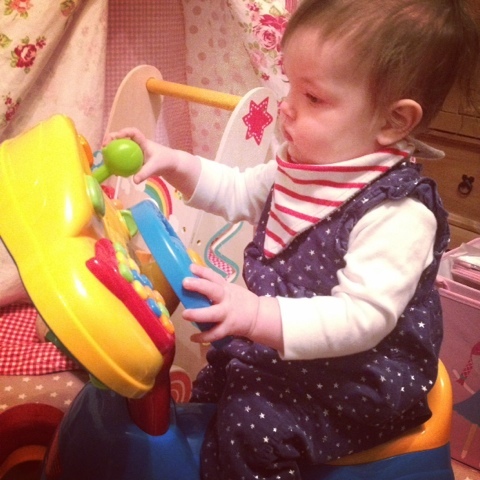 Wooden cars in general are beginning to become a toy of interest, as Isabella now knows how to play with them. 5) Panda paws in the 'That's not my teddy...' book - This is a 'touchy feely' book with an array of bears with different textured paws. Isabella's absolutely loved scratching the Velcro material on the panda's paws. She is always searching for and is intrigued by different textures, so this book is perfect. Recently she has been really paying attention when we're reading her books - wanting to turn the pages, looking at the pictures and listening carefully. Just so adorable. What has your little one loved this month? She is so cute! I really like the idea of Oxo Tot drinking cup, Bo is currently drinking from a Nuby sippy cup which is quite successful but I always like to try different brands and types. Bo has been loving her Little People Ride On Car which she got for Christmas and also her ball pool, mainly because she loves throwing the balls out of it and making a huge mess!